MX-5 Scotland • View topic - Anyone ever seen/used these ramps? Anyone ever seen/used these ramps? I have a decent trolley jack and axle stands but I was thinking about buying a set of car ramps as well. I came across these ramps in the thread on Pistonheads and the owner pointed me in the right direction. The extra lft looks like it could be useful - has anyone ever come across these before? Previously in a 2003 Montana, and a 1991 V-Special...Now in a Bongo!! Re: Anyone ever seen/used these ramps? Yes there are two versions. One that has a screw thread to raise them and the other version has a hydraulic ram in them and they are more expensive. Nearer £400. IanH on here has the screw version and uses an Impact wrench to screw them up as otherwise it can be a bit of a pain getting them in the air. If you do not already have an impact wrench the £70 Clarke mains powered unit does the job. He should be along later. 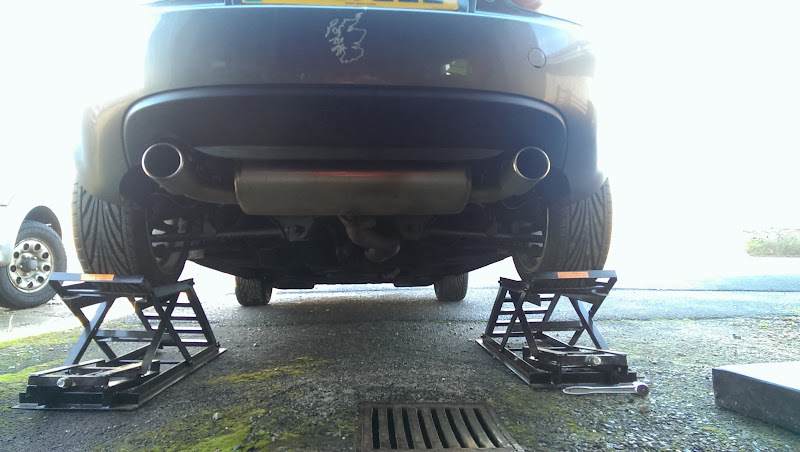 Here they are partly extended under my NC1. Ian, do they lock out in any way once they are extended up? I take it in that photo you were still using a socket to extend them? I need to trace an annoying oil leak, and also want to try loosening the PPF to raise my gearbox slightly to try and eliminate gear lash noise so I think I can just about justify these! There isn't a specific lock out, however with the pitch of the screw thread I would expect runaway descending to be highly unlikely. Yes that is with the socket pre power wrench. Not sure these are PUWER risk assessed or CE marked.. hand tools so they miss the "powered tools" part of PUWER, and not "at Work" so miss out again ... not CE marked I suspect which is dubious. Easy secondary retention would be a block of wood between the 2 horizontal parts (not with vertical growth marks.. i.e. on their side). I still labour on with trolley jack and about 5 sets of axle stands.. must actually fit the ramp one day! Off to see if I can snaffle another trolley jack.. The problem with CE marking is that independent test of the unit is optional. It is quite legal for the manufacturing company to self-certify the unit as meeting CE standards. Virtually all this kit is made in China and imported to the UK by well-meaning merchants, not a criticism more a fact. Unless the UK seller has a qualified testing and design engineer on board or on contract with the budget to test the unit, you are dependent on some faceless company half way around the globe self-certifying the unit. The latest fiasco this period with hover boards comes to mind. 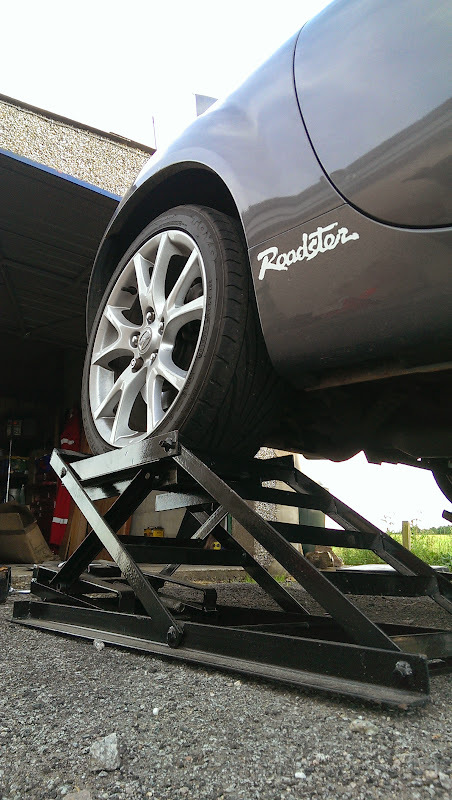 The self-certification route caused one garage equipment company last year to stop importing a particular car lift which had been independently certified after the unit was improved at a cost to meet regulations. The importer could get nowhere near the cost of the self-certified units on sale in the UK. Even the big names with the main dealer branding like, Dunlop not the tyre company, Bradbury, Rotary, Tecalemit are brining there kit in from China with their badging on but you would hope the design and testing is overseen by qualified people. they certainly look a handy piece of kit which if used regularly would pay for themselves. ps the lifting capacity could be restricting at 1000kgs? Most cars are 60% weight on the front. Therefore a Range Rover sized SUV is too heavy. Also if someone is playing about with a Roller or Bentley cheap as chips these days for an older model again over the limit.